Join PFAM at Indianapolis Screening of Healthcare for All Documentary! Why do we Americans pay the world’s highest health care costs, yet still have such overall poor coverage? How can we make a change? 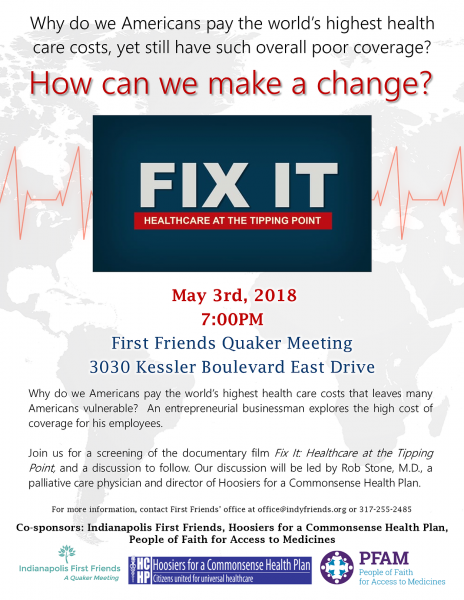 On May 3rd at 7PM, People of Faith for Access to Medicines is pleased to co-sponsor a screening of the documentary film Fix It: Healthcare at the Tipping Point, and a discussion to follow. Our discussion will be led by Rob Stone, M.D., a palliative care physician and director of Hoosiers for a Commonsense Health Plan.